I know this question is older but I was looking thru the answers and thought that I might be able to expand on the "dynamic" portion of the problem and possibly help someone out. First and foremost I built this solution to solve a problem a couple of coworkers were having with inconstant and large data sets needing to be pivoted quickly. This solution requires the creation of a stored procedure so if that is out of the question for your needs please stop reading now. This procedure is going to take in the key variables of a pivot statement to dynamically create pivot statements for varying tables, column names and aggregates. 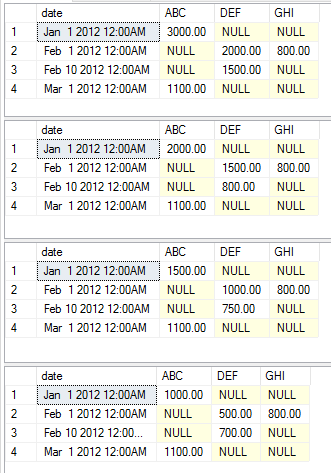 The Static column is used as the group by / identity column for the pivot(this can be stripped out of the code if not necessary but is pretty common in pivot statements and was necessary to solve the original issue), the pivot column is where the end resultant column names will be generated from, and the value column is what the aggregate will be applied to. The Table parameter is the name of the table including the schema (schema.tablename) this portion of the code could use some love because it is not as clean as I would like it to be. It worked for me because my usage was not publicly facing and sql injection was not a concern. The Aggregate parameter will accept any standard sql aggregate 'AVG', 'SUM', 'MAX' etc. The code also defaults to MAX as an aggregate this is not necessary but the audience this was originally built for did not understand pivots and were typically using max as an aggregate. Lets start with the code to create the stored procedure. This code should work in all versions of SSMS 2005 and above but I have not tested it in 2005 or 2016 but I can not see why it would not work. Next we will get our data ready for the example. I have taken the data example from the accepted answer with the addition of a couple of data elements to use in this proof of concept to show the varied outputs of the aggregate change. This execution returns the following data sets respectively. Good job! Can you please make an option of TVF instead of stored procedure. Would be convenient to select from such TVF. Unfortunately not, to the best of my knowledge, because you cannot have a dynamic structure for a TVF. You have to have a static set of columns in a TVF. The below code provides the results which replaces NULL to zero in the output. So \@cols must be string-concatenated, right? We can't use sp_executesql and parameter-binding to interpolate \@cols in there? Even though we construct \@cols ourself, what if somehow it contained malicious SQL. Any additional mitigating steps I could take before concatenating it and executing it? How would you sort the rows and columns on this? @PatrickSchomburg There are a variety of ways - if you wanted to sort the @cols then you could remove the DISTINCT and use GROUP BY and ORDER BY when you get the list of @cols. I'll try that. What about the rows? I'm using a date as well, and it doesn't come out in order. Not sure what you mean by rows @PatrickSchomburg. You still should be able to use ORDER BY to sort the data. Nevermind I was putting the order by in the wrong spot. I have the similar problem but Instead of Category I have the categoryId. Category name comes from a different table. So would that be possible to read the column header from another table? @akd If I understand the questions correctly, you should be able to do this. You'd just have to join the tables in your PIVOT and query the other table when getting the @cols. Thanks but I am not sure where the join should go n the query? @akd Before trying to write it as a dynamic query, write it as a hard-coded version so you get the joins correct, then convert to dynamic. That's going to be the easiest way to proceed. Otherwise, you'll have to ask a new question about it, because it's going to be too difficult to try an debug in the comments. Same here as @akd, I have a huge join block and a huge where block. Normally they are identical for both queries, the question is where am I supposed to put them ? Can they be put in one place only and used by both for easy editing of conditions later ? @Enissay my suggestion would be to write the query as a static/hard coded version first, then convert it to dynamic sql. This allows you to get the logic and the result you want before diving into dynamic sql. This works perfectly. I just would like to learn what all this sentence means: STUFF((SELECT distinct ',' + QUOTENAME(c.category) FROM temp c FOR XML PATH(''), TYPE ).value('. ', 'NVARCHAR(MAX)') ,1,1,'') Especially the part "FOR XML PATH(''), TYPE ).value('. ', 'NVARCHAR(MAX)')"
FWIW QUOTENAME only helps SQL injection attacks if you are accepting @tableName as a parameter from a user, and appending it to a query like SET @sql = 'SELECT * FROM ' + @tableName;. You can build plenty of vulnerable dynamic SQL strings and QUOTENAME won't do a lick to help you. @davids Please refer to this meta discussion. If you remove the hyperlinks, your answer is incomplete. @Kermit, I agree that showing the code is more helpful, but are you saying it is required in order for it to be an answer? Without the links, my reply is "You can achieve this using dynamic TSQL". The selected answer suggests the same route, with the added benefit if also showing how to do it, which is why it was selected as the answer. I up-voted the selected answer (prior to it being selected) because it had an example and will better help someone new. However, I think someone new should also read the links I provided, which is why I didn't remove them.